They may not look like it, but penguins are tough birds -- they can survive in some of the coldest temperatures on dry land, all the way down in Antarctica. They keep from getting too cold by using a combination of evolutionary advantages, like their feathers, and behavioral tricks that call on the group to function as a large, cohesive unit. 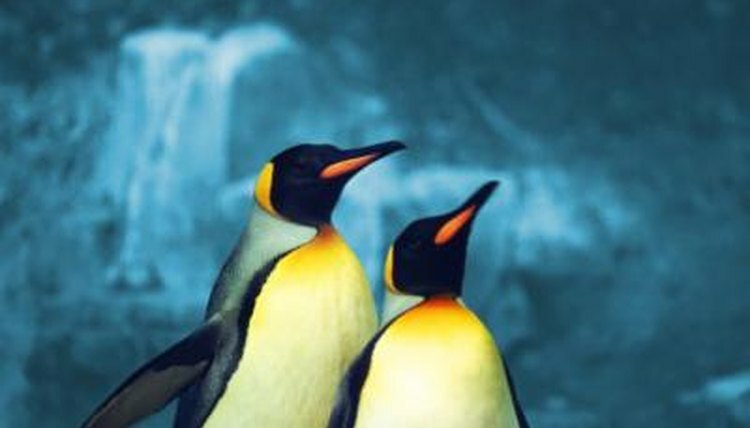 Penguins aren't born to resist the cold -- in fact, quite the opposite is true. Baby penguins, or chicks, can't keep their body heat up like adults can. It takes about 40 days before a chick is ready to keep himself warm, so until then, he lives almost exclusively tucked under his parents. Adult penguins have a flap of skin and fat between their legs called a brood patch, under which they tuck a chick. The brood patch drapes around them like a big warm blanket, keeping them from getting too cold. Fortunately for the penguin, these animals have some biological advantage that enable them to live in frigid environments. First, penguins have blubber under their skin -- this is a type of fat layer that many cold-weather animals like whales and polar bears have to insulate their bodies. Penguins also use their feathers to keep warm. While the feathers themselves get cold, they effectively trap air between the penguin's body and the inside of his feather coat. The penguin's body temperature heats the air trapped by his feathers, helping him stay warm. Not all penguins are as adept at staying warm as others. Penguins are generally built for speed -- they have aerodynamic bodies that allow them to zip through water in pursuit of prey. Generally, though, penguins in colder climates are bigger. Emperor penguins, for example, are big and round. Their bodies consequently hold the heat better than a slimmer penguin's, which is why these bird can be found in Antarctica's colder regions. Sometimes, it takes a group effort to keep from getting too cold -- and penguins know how to work as a team. During Antarctic winters, penguins huddle together in a tightly packed group so that their body heat builds and warms the group. Since the penguins at the middle of the huddle are the warmest, they shuffle around every few minutes, allowing those from the outside of the group to make their way inward for a chance to heat up.